Making quick money or easy money is the dream of many a people and organizations and due to this ambition, lots of schemes are launched. Everybody wants to be rich and famous and for that various schemes have been introduced. In the past quite innovative schemes like chit funds, plot ownership, teakwood scheme, collective money schemes have been devised to make easy money. Keeping the trend going, one such scheme has been introduced in the shape of Freedom 251 mobile phone scheme which has taken the world by storm. This appears not only fishy and unbelievable but also such ponzi scheme will make the owners of the company rich and famous. However the scheme also exposes the vulnerability of the general public. Now whats the scheme all about….? One non descript company appears out of nowhere with an offer for selling a smartphone on an unbelievable price of Rs 251 with features which can make many other existing smartphones look pale in comparison. The offer was to book the phone online for an initial period and to be delivered after some months or so. To make it appear transparent and genuine, popular and senior political leaders and ministers were invited to launch the scheme. 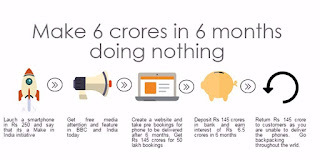 Lacs of people hit the website of the company to book the phone online and the successful buyers were assured to provide a link for submitting personal details for deliver and payment later. How the company will dupe the buyers..? 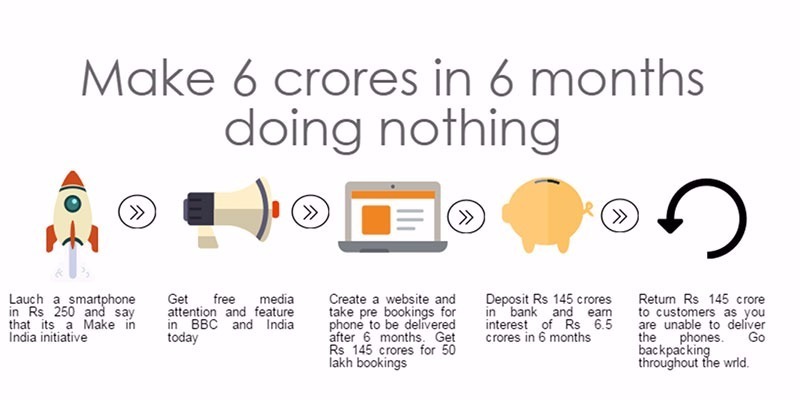 Now if the money collected by the company is deposited in the bank with a minimum interest rate of 6.5% for 6 months, the company will earn approximately 4 crores interest in 6 months without any hitch. Even if due to any reason, either by Govt. action or other regulating agencies, the company is forced to refund back the public money, still it will retain the interest earned on the deposit amount. And keeping in view our legal system, it will take years for people to get their money back. There are instances that Owners and CEOs of many such companies are not caught and not proved guilty for long time. You must be knowing the famous people who have not refunded the public’s money even after ordered to do so. Therefore, before subscribing to such schemes it is advisable to go through the details and viability of such dubious schemes. 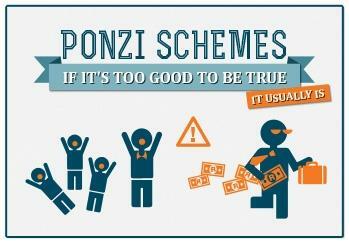 One needs to apply their own mind and take necessary precaution in money duping schemes. Even though such ponzi schemes have come and gone but poor people still get lured by such money making schemes whenever they are launched. How Do Banks and Housing Finance Companies Decide on the Loan Amount? As you prepare to buy a new home or intend to build your dream home, more often than not it is the financial aspect that calls for a closer scrutiny. The market is flooded with different kinds of home loan schemes, each one seeming to be more attractive than the others and it is herein that a prospective customer must lay emphasis on. 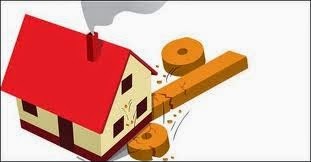 As the risks in offering a home loan is higher, the loans carry a higher interest rate and a bigger down payment. But what are the criteria banks adopt to offer you a home loan to enable you o buy it. Usually, most banks and housing finance companies give home loans up to a maximum of 85% of the cost of the house. The 15%, sometimes called 'seed money' or 'equity', will have to be provided by the loan applicant. The amount, for which the applicant is eligible, is determined by the age, income, number of dependents, monthly outgoing and repayment capacity. This varies from case to case. The Bank/HFC assesses your repayment capacity while deciding the home loan eligibility. Repayment capacity is based on your monthly disposable / surplus income (which in turn is based on factors such as total monthly income / surplus less monthly expenses) and other factors like spouse’s income, assets, liabilities, stability of income etc. The main concern of the bank is to make sure that you comfortably repay the loan on time and ensure end use. The higher the monthly disposable income, higher will be the amount you will be eligible for loan. Typically a bank assumes that about 55-60 % of your monthly disposable / surplus income is available for repayment of loan. However, some banks calculate the income available for EMI a payment based on an individual’s gross income and not on his disposable income. The amount of the loan depends on the tenure of the loan and the rate of interest also as these variables determine your monthly outgo / outflow which in turn depends on your disposable income. Banks generally fix an upper age limit for home loan applicants. Only if you qualify in there criteria for giving loans, you can go for a home loan to build your dream house. 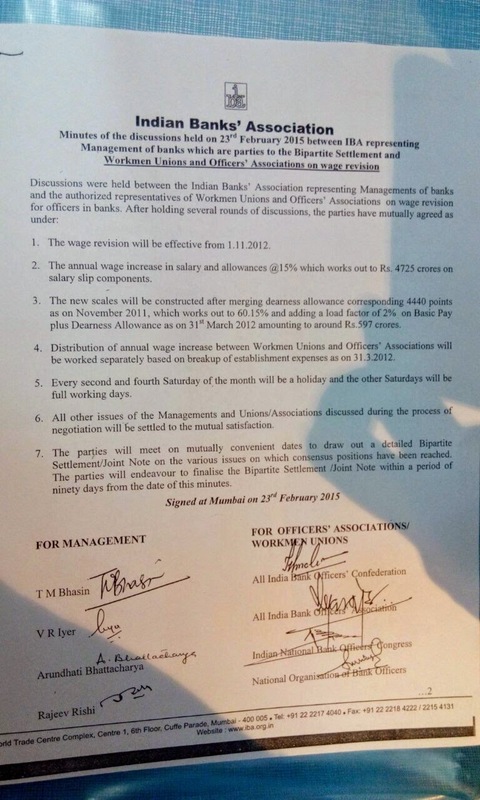 Long awaited wage revision for Bank employees and Officers has been finally settled with 15 % pay rise. The wage revision agreement reached between UFBU and IBA on 23rd February, 2015, which can be considered as breakthrough in over 28 months old overdue wage revision for bankers. Now the Bankers will have two Saturdays off in a month in addition to the wage rise. The wage revision will be implemented with effect from November 2012. There are 27 public sector banks in the country with a combined employee strength of about 8 lakh. There are about 50,000 branches of these banks across the country. The Central Board of Direct Taxes (CBDT) has revised a value for the cost inflation index for 2014-15 vide Notification No. 31/2014, Dated: June 11, 2014. The Cost Inflation Index helps reduce the inflationary gains, and the index is useful for income-tax assesses in the computation of tax on long-term capital gains. The profit that arises on the sale of any property is referred to as Capital Gains and is chargeable to tax. But Govt also provides for various schemes for saving tax on such capital gains under Section 54, 54B, 54D, 54F etc. However, as per the provisions of these sections, the amount is required to be reinvested in specified investment types before the specified period. However, if the due date of filing income tax returns falls before the expiry of the specified period, the amount of capital gains is required to be invested temporarily in the Capital Gains Account Scheme which can be easily withdrawn at the time of investment in the specified instrument. As per the Income Tax Act, the taxpayer is allowed some time (2/3 years) to invest the capital gains in specified instruments. However, in many cases the due date for filing income tax returns for the year in which the capital gains arises is before the expiry of the specified period. 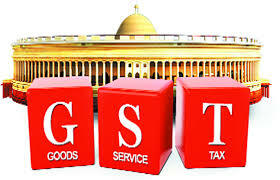 To avoid such issues, the income tax act prescribes that the taxpayer should deposit the amount of capital gains in the capital gains account scheme on or before the due date of filing of income tax returns which can be easily withdrawn at the time of investment in the specified instrument. 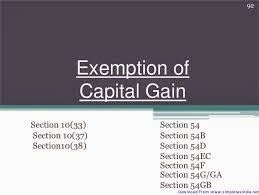 The Capital Gains Account Scheme was introduced in the year 1988, and as per the Capital Gains Account Scheme the amount of capital gains to be claimed as an exemption should be either be re-invested or deposited in the Capital Gains Account before the due date of filing of returns. The Govt has notified 28 banks which can open the Capital Gains Account on behalf of the Govt. All branches of these 28 banks except Rural Branches are authorised to open the capital gains account. Capital Gains Account -Type A – Savings Account: This is like a normal savings account and the interest payable on this account is the same as the interest paid on normal savings account by that bank. Capital Gains Account -Type B – Term Deposit Account: This is like a fixed deposit wherein the amount is deposited for a fixed period of time. The interest rate on this account is equivalent to the interest paid on fixed deposits by the bank. As Type B accounts are same as Fixed Deposits Account, any withdrawl from this type of account attracts a penalty for pre-maturity withdrawl. The interest paid and pre-maturity penalty levied varies from bank to bank and is different for different banks. Capital Gains Account Type A is advised when the amount of capital gains is to be used for construction of a house as the amount would be required to be withdrawn in various stages. Type B Term Deposit Account is advised when the amount of capital gains is to be utilised for purchase of a house. Capital Gains Account Type B is also of 2 types – Cumulative and Non-Cumulative. Under the cumulative option – the interest is re-invested and the total amount is paid at the time of the completion of the term period or at the time of withdrawl (whichever is earlier). Under the non-cumulative option, the interest is paid at regular intervals and is not reinvested. To deposit the amount in the capital gains account, the taxpayer would first be required to apply for opening the account by making in application in Form A. He would also be required to submit the following documents along with Form A – Proof of Address + Copy of PAN Card + Photograph. Type A Account can be converted into a Type B Account and vice-versa on an application made by the taxpayer in Form B. The amount deposited in the Capital Gains Account can be withdrawn by making an application in Form C. The amount so withdrawn has to be utilized within 60 days from the date of such withdrawal and only for the purpose of such withdrawal. The unutilized amount should be re-deposited immediately. For subsequent withdrawal, the application is required to be made in Form D by detailing the manner/purpose for which the previous withdrawal has been utilized. Many Banks don’t issue any cheque book for the capital gains account and amount as the amount is to be withdrawn not using a cheque but by furnishing an application in Form C/ Form D.
Only Individuals and HUF are allowed to open capital gains account. The amount deposited in the Capital gains account cannot be offered as a Security for any Loan/ Guarantee. The Interest on such account is not tax-free and TDS is also liable to be deducted from such account as per the provisions of the income tax act. The taxpayer can also appoint nominees to this account by making an application in Form E. Such nomination can also be cancelled by making an application in Form F.
To close the Capital Gains Account, an application in Form G is required to be made. In case of the death of the depositor, such application would be required to be made by the nominee/legal heirs in Form H.
The approval of the income tax officer who has the jurisdiction of the depositor is also required at the time of making an application for the closure of the account. If the amount deposited in the capital gains account is not utilised for the specified purpose before the expiry of the specified time, the amount of capital gains not utilised would be chargeable to tax as capital gains in the financial year in which the time period expires.